In Italy, “the land of a thousand bell towers,” rustic towns love the sound of their own church bells. They each have their own dialect, favorite saints, and folklore. 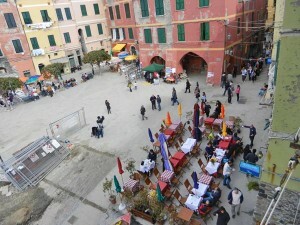 The folklore of Vernazza and Monterosso will be enlivened with tales of the flood of 2011. In Monterosso, beloved statues in the church survive — while a mud-line halfway up the wall in the nave is a reminder that the townspeople heroically came to their rescue, taking them through raging waters to higher points. Later, when there was enough help in the streets, excess volunteers came into the church and lovingly polished the candlesticks, just to keep caring for their town. To this day, shops have flood-damaged items on sale — you can buy a “flood umbrella” cheap. A big tent, set up by the National Guard, functioned through the winter as the town piazza — used for staging emergency deliveries, community meals, Christmas Eve Mass, and the New Year’s Eve disco. Old ladies who couldn’t help dig, helped cook. People worried that Laura, whose bakery — loved for her secret recipes — was destroyed, and wouldn’t reopen. But she rebuilt, and that beautiful aroma of her sweet cakes still helps locals greet the new day. Diego’s motorbike, the bike of his dreams, which he had bought just 10 days before the flood, was buried. He excavated it, cleaned it up, and — to the cheers of his friends — it started. Precious statues, rescued amid all the chaos, wait patiently for their church to be dug out and cleaned. 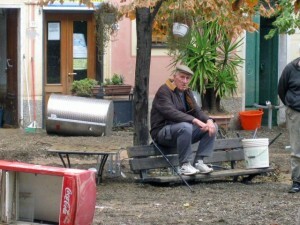 Even after the flood, this man had to sit on the bench he had warmed for decades. The local civil protection unit is now named for Sandro Usai — Monterosso’s one death from the flood. Sandro was last seen heroically trying to open up a grate to increase canal drainage when he was swept out to sea. When his body washed ashore a week later, his funeral was the first time the community stopped working and was silent together. Sandro Usai received the highest civilian award the Italian government gives. 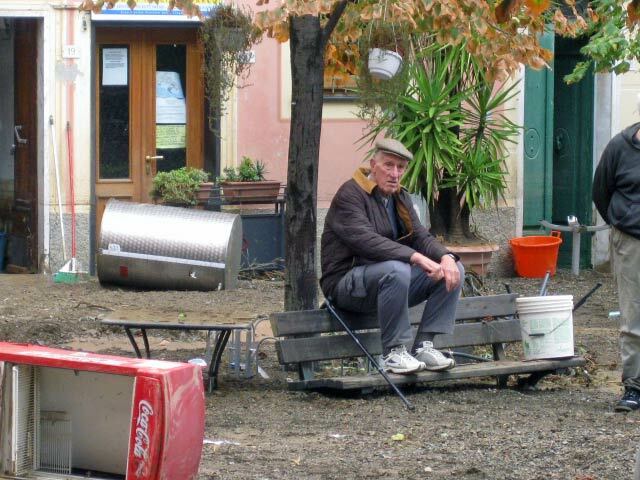 Little Vernazza lost three residents: Pino, the gelato man; Sauro, a shopkeeper; and 80-year-old Pina. Pina refused to leave her apartment. Sauro also refused to leave. He was last seen hanging on to the awning of his building in a muddy torrent. Their bodies washed up together — three weeks later — on the beaches of St. Tropez, France. Psychologically, the trauma and aftermath of the flood is toughest on the local seniors. Many have barely ventured beyond the Cinque Terre. They know nothing else. Every day, for many decades, they’ve warmed the same bench with the same friends. One old man, who had long spent his afternoons on a bench that was covered up to the seat in mud, still came in the days after the flood, with his cane to steady himself, sitting on the top of the seat back of his buried bench, hanging on to a little normalcy. For 30 years I’ve strolled the main drag of Vernazza as if walking through a poem. Walking down that street now — gutted of nearly all its businesses, the dreams and labors of love of its residents swept so violently away — is an emotional roller coaster. Tonino is painting a new door where his boat, Gustina, was once kept. On the wall behind him, a photo of his boat comes with a painted-on caption: “Tonino loved me and the flood kidnapped me.” Tonino said it was lucky he had been stranded across the street when Gustina was swept away, or he likely would have been swept out to sea with her. What had long been the best nightspot in town, the Blue Marlin Bar, is an empty concrete shell. The only piano in town is gone, along with all the shipwreck decor (and a dozen years of family Christmas cards I’d sent, which he’d collected on his bulletin board). Massimo, looking tired and sporting a scraggily white beard, is barely recognizable. Having not shaved since October 25, he says he’ll shave when the Blue Marlin reopens next month. Even though the space is newly plastered and quiet, there’s a hole left in the wall that will always come with a horrific story. 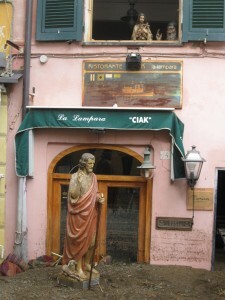 Forty locals and tourists were trapped in the bar with the water rising and no way out. Massimo knew which bit of wall was thin, and, fortunately, a hammer had been left out nearby. 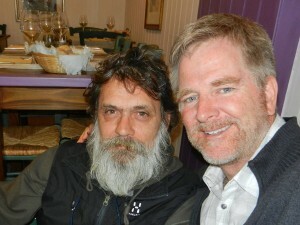 With his bartender, Jeff (the only American man living in Vernazza), they broke through the wall and heroically helped all 40 trapped inside to escape through the hole into a staircase leading to safety. In the chaos, one Vernazza woman recalls kissing her little girl, passing her through the hole while thinking she might never see her again. Massimo, who broke a wall to rescue 40 trapped people, will shave when his Blue Marlin Bar reopens. On October 25th, one of our tour groups was in Vernazza. At the height of the flood, they were stranded in a restaurant, literally standing on tables as the water rose. Throughout town, people had taken refuge, as people do in a sudden downpour, in shops and restaurants, to wait for it to pass. But this storm wasn’t passing. The downpour persisted and the water just kept rising. I heard many stories. And all noted how, amazingly, the water receded for a moment before rising again to its ultimate height. This gave people (my tour group included) a window of time to scamper out and up nearby staircases to safety. While many thank the town’s patron saint, the Madonna of Reggio, others figure a bus lodged in the narrowest part of the main street, causing a backup that let the flooding below it recede — just momentarily. Knowing that every car in the lot above the town was swept into the sea, I walked to the top of Vernazza to inspect the scene. There’s a stillness there, as nothing here has reopened yet. Stone walls laid by medieval Vernazzans stand ripped apart, delicate bridges that arced over the ravine to favorite B&Bs are long gone. My favorite, the place I slept in last year, is boarded up. And the resident ducks — a favorite for locals and tourists alike for ages — are long gone. Standing on what was the town’s playground, looking over the raw, open wound of an enlarged ravine and desolate buildings, I had to spill some tears. It was like I was visiting a dear relative in the hospital — someone who had been very sick and was still weak…but was out of the woods and recovery was assured. It was here that an idea struck me: I would put as a subtitle on the cover of the next edition of my Cinque Terre guidebook “Viva Vernazza”: Vernazza lives. Life is returning to Vernazza's harbor square…piano, piano. Thank you so much for all you have done to promt Vernazza and Montreosso! My life long dream came true in 2009 when with the help of your guide book series my husband and I traveled to Italy and “lived” there for a month. While there we took your advice and visited the villages of the Cinque Terre. I haved longed to return and finally will in September of this year. This trip we are going directly to the Cinque Terre and will spend two nights in each of the five villages!!! Even with the floods I am so excited to return. It is what the people need most! They need all our love and support and for people to come! Your travel guides are indispensable and without them we would have been lost many times. I am trusting in you to get me there again and thank you for the confidence you gave me to feel so comfortable in returning. If ever you have the chance visit the small village of Fauglia where we stayed it is very close to Pisa in the wonderful Tuscan region. You look so different with a beard. Thanks for keeping us informed on how they are doing. It’s good to know that the catastrophe was over and everyone’s back on track. Have a safe trip all the time!